Sambars have been an ideal meal solution these days, especially those made with earthy toor dal and sweet tangy tamarind. Warming and satisfying, I took refuge from the bitter cold hovering over a bowl of this sambar that featured as the main course of the meal. 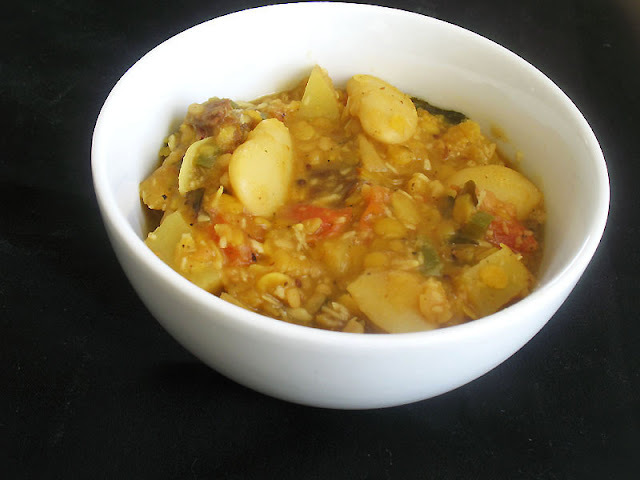 This time, I added some cooked lima beans to the creamy toor dal for some meaty texture and seasoned it with my favorite south Indian spices. A little unconventional I suppose, but very authentic tasting with the more traditional spicing. It all came together just right in very little time at all. Because this sambar is more filling and substantial than most of the sambars I am accustomed to, very little is needed to complete the meal. Serve the sambar with a vegetable side, some basmati rice and some savory Indian flat breads if you please. The dining experience would be enhanced with a soupy rasam served as a first course. Note: sambar powder, along with the other ingredients in this recipe, is easily available at any Indian grocer, but you can make your own fresh spice blend from scratch using this recipe. Rinse the lima beans and soak for 8 hours or overnight in several inches of water. Drain and rinse then transfer to a medium saucepan and cover with fresh water. Bring to a boil, reduce heat to low, cover, and simmer until tender but not falling apart — 35 to 40 minutes. Drain and set aside. Meanwhile, soak the tamarind paste in 1 cup of hot water for 30 minutes. Place the toor dal in a large saucepan and add 3 cups of water and the turmeric. Bring to a boil, reduce heat to medium-low, and simmer until the dal begins to break apart — about 40 minutes. If desired, whisk the cooled dal for a creamier texture. Now add the potato, tamarind paste and its soaking water, and the cooked lima beans. Pour in another cup of water and simmer for 15 minutes until the potatoes are tender. Stir occasionally, adding more water as needed. Heat the ghee or oil in a small frying pan or saucepan over medium heat. When hot, toss in the mustard seeds, cumin seeds, ural dal, dried chilies and curry leaves. Stir and fry until the mustard seeds turn grey and begin to splutter and pop. Add the asafetida, stir once, and then add the ground coriander and sambar powder and stir for another 30 seconds. Add the tomato, fresh chilies, coconut and salt. Simmer until the mixture is thickened — about 5 minutes. Transfer to the cooked sambar, stir, and cover. Let stand for 5 minutes to allow the flavors to blend. Serve hot over fresh cooked white rice, garnished with chopped cilantro if desired. Alongside your favorite Indian flat bread you have a complete and satisfying meal. I need to get back into my Indian cooking endeavors! This sounds like just the thing to get started.